Compression molding has been employed for manufacturing plastic parts since the advent of the plastics industry. This method was utilized the by bakery industry for cookie and cake molding before plastic materials existed. Compression molding is most commonly used to manufacture thermoset plastic parts, and it is suitable for thermoplastics also. The raw material for compression molding is usually in the form of granules, putty-like masses, or preforms. The material is placed into an open, heated mold cavity. 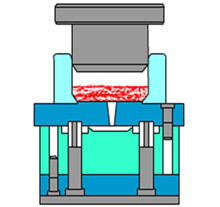 The mold is closed and pressure is applied to force the material to fill the cavity, thereby conforming to its shape. Often a hydraulic ram is utilized to produce sufficient force during this process. The heat and pressure are maintained until the plastic material is cured.